Manchester Museum, part of the University of Manchester is undergoing a £13 million transformation, to become the country’s most inclusive, caring and imaginative museum. The development, hello future, is being launched on 2 October, when work will begin to create new galleries devoted to South Asia and to Chinese Culture, the world’s first Centre for Age Friendly Culture, a new exhibition hall, new entrance facing Oxford Road, and improved visitor facilities with a focus on inclusive and accessible design. The Museum’s new emphasis on inclusivity will feature a multilingual design, created in collaboration with the Multilingual Manchester research unit at the University of Manchester. 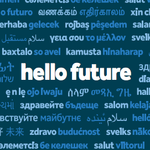 Hello future campaign has already been translated into 50 of the city’s languages, and Manchester Museum are preparing new and creative solutions for multilingual exhibition signage, multilingual museum tours and workshops that will make Manchester Museum the country’s first major cultural institution to embrace language diversity.